November Homeless figures show yet another increase. 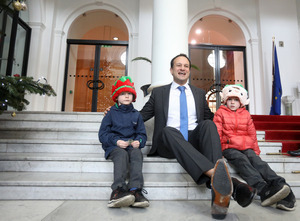 Within hours of the Oireachtas finishing up for Christmas (the Seanad was sitting yesterday), Minister for Housing Eoghan Murphy publishes the homeless in emergency accommodation numbers for November 2018. A record 9,968 nationally are homeless. That includes a near record of 3,811 children. 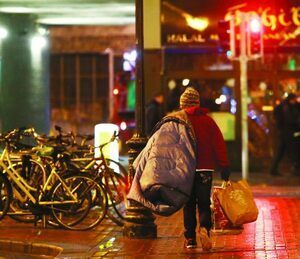 In Dublin, a record 6,945 are homeless. That includes a near record 2,816 children. The government is going to extreme lengths to keep people off the list to stop it breaching 10,000. 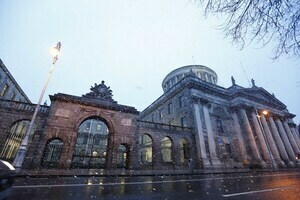 It’s estimated at least an addtional 600 are without a home and receiving support from the government homeless services. Of course, it ignores rough sleepers which are a downward trend at the start of the year are increasing again. And it ignores those who want their own accommodation but are stuck with family or friends or 8-in-a-double-bedroom bunks. Let’s hope in 2019 the CSO take over the compilation of these numbers and Murphy is fired into back bench oblivion until the next election. Meanwhile, the figure of 9,968 reflects an increase of 244 people since October when 9,724 people were recorded as staying in State-funded emergency accommodation. Posted in Misc and tagged Homeless, Rough sleepers at 10:20 am on December 21, 2018 by Bodger. Ah but no, sure we’ve already started building the wall, er…I mean houses. it’ll probably get worse before it gets better. 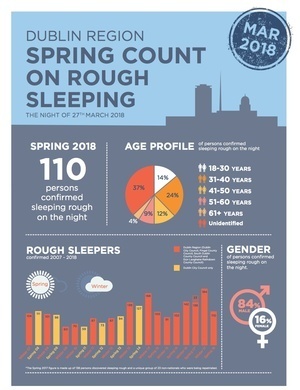 Great, rough sleepers aka homeless are trending down. Good job Leo. This has been acknowledged by government as a crisis. Yet, it continues to get worse. At what stage should the Minister for Housing admit he is failing and resign? If he thinks that a different person could solve the issue. It isn’t an easy problem to fix. It’s not easy no. But still not enough is being done. The vacant site levy was not implemented properly, the fast-track scheme in Poolbeg has failed, social housing targets were not met, too many council houses still lie empty, falling into dereliction. It won’t be solved overnight, but we should at least expect progress in the right direction. What a spin obsessed shower of incompetents who are lining the pockets of a certain cohort with taxpayers money for emergency accommodation that is vastly more expensive than traditional housing. They’ve had eight years to address housing, it’s been five years since we waved goodbye to the IMF bailout, we’ve got money for rainy day funds, to cut taxes and maintain tax reliefs on plutocratic pensions, but they can’t address that basic need of shelter and in December 2018, we have achieved a new record of shame. These points are all true. More can and must be done to increase the housing stock. However, for balance, the population of Ireland has increased by 282,000 people since 2011 (a 6% increase). There are at least 270,000 more people in homes today than when FG took over. Incompetent. Cynical. Spin obsessed. Flushing our money down the toilet of emergency accommodation. Unable to meet basic targets. 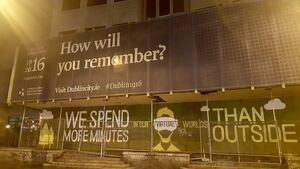 And who will forget the promise by Simon Coveney to end the disgrace of children living in hotel rooms by June 2017. Let’s pray the present galoot disappears from politics. Your link shows were 230,000 vacant houses/flats in 2011. No wonder building stopped – there was way too many empty homes, and the banks (who had no money anyway) refused to lend to builders. As for the State in 2011? So has a deficit of €22bn – we were spending 138% of what we were earning. Perhaps NAMA’s ace team of private dicks,can find some,after they finished sniffing around developers/builders,WAG’s knicker drawers. Is FEAR really a strategy,or does FG believe embarrassing and harassing the entitle development/home building industry was helpful in getting homes built ? NAMA would do anything,no matter how demeaning except create an environment conductive to building houses. Even if you keep repeating it, it still won’t be true. NAMA have financed thousands of homes. ‘NAMA may fund, subject to commercial viability…. Your link Cian-MAY-after they finished with a novel and new approach to lending partnerships,shock and awe,NAMA deliberately leaked private and confidential information on developers/builders to embarrass and humiliate them. But mainly to distract people from their and FG’s incompetence in housing,development. This is one the most highly respected builders/developers in Ireland. At the outset, it is important to note that NAMA does not build residential property. Instead, where commercially viable, it funds residential delivery on sites controlled by its debtors and receivers. NAMA is making a significant contribution to the supply of housing within the State and has committed to facilitating the delivery of 20,000 residential units by the end of 2020, when the agency is due to wind up. As of August 2018, I am advised that NAMA has delivered over 7,800 new residential units as part of its residential delivery programme. A further 2,800 homes are under construction and full planning permission has been granted for 7,800 units. Planning has been lodged, or will be lodged in the next 12 months for an additional 10,200 homes. Finally, pre-planning or feasibility work is underway on sites that have a delivery capacity for just over 15,000 residential units. These numbers aren’t a true reflection, the number is a lot higher but DCC, who’ve been lumbered with this problem, massage them to appear lower. Guess how I know? Guess who’s been into the prosecco this morning??? *Not in any way, sadly. Fine Gael are a dreadful bunch of empty suits, spin fans and pen pushers. This should be a national emergency, bring the army in to help build new homes quickly! Its not like there is no space to build. Irish Politics, Jesus Christ!